To escape the oppressive Taliban regime, millions of Afghanis fled their homeland and crossed the border into Iran. Najaf (Gholam Ali Bakhshi) is an Afghani immigrant working at an Iranian construction site, where he reports to Memar (Mohammed Amir Naji), who runs the place. When Najaf falls and breaks his leg, he has no alternative but to send his daughter Baran (Zahra Bahrami), who he disguises as a boy, to work in his place. Under the assumed name of Rahmat, Baran becomes a fixture at the construction site, much to the annoyance of Lateef (Hossein Abedini), an Iranian teenager who feels his own job is now in jeopardy. But when Lateef inadvertently discovers that Baran is a girl, he finds himself falling in love with her. Eventually, the local authorities learn about the site's foreign workers (it’s illegal for Afghanis to hold certain positions), and force Memar to lay them all off. In an effort to remain close to Baran, Lateef takes it upon himself to watch over her family in their time of crisis, helping out whenever he can. With Baran, writer / director Majid Majidi weaves a wonderful, warm-hearted tale of infatuation that blooms under very difficult circumstances. At the outset, Lateef shares the same opinion as many Iranians, who resent the Afghanis for taking up residence in their country and stealing their jobs. Lateef’s eventual relationship with Baran causes him to re-think his position, and before long, he’s not only accepted her and her family, but is doing whatever he can to help them out. Though it touches upon the plight of foreigners in Iran, Baran is not a political movie; it’s a human one, relating a story of love and respect that transcends cultural barriers. In the U.S., we’ve been conditioned to view Iran as the enemy, and its citizens as extremists who wish only to destroy our way of life. What makes Baran such a fascinating film is that it offers a glimpse into the lives of those who, despite being citizens of a so-called “evil” country, are, like most people around the world, just doing their best to survive. In much the same way Lateef learns an “enemy” can sometimes become a friend, Baran provides Americans with a fresh perspective. 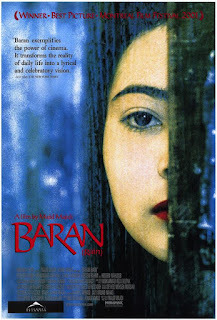 A subtle, beautiful motion picture, Baran is also an eye-opening experience. I'd like to see this one. Going to search around for it. Thanks for the post!